March 1, 2012 | Category Newsletter, Recipes. 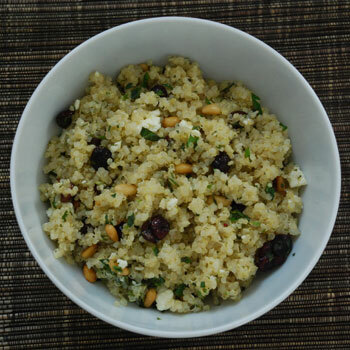 Here’s a tasty quinoa recipe that we hope you will enjoy. It’s loaded with fresh herbs, lemon and protein rich quinoa. Quinoa (pronounced keen-wah) is considered a complete protein because it contains all the essential amino acids necessary for our nutritional needs. Although it is cooked and eaten like a grain, quinoa is technically a seed, and is related to spinach, chard and beets. It’s also high in iron and calcium, and is a good source of manganese, magnesium and copper, as well as fibre. It makes a delicious alternative to rice and other grains. Was, rinse and drain quinoa. Place in a 2 quart pot, add water and salt, bring to a boil, lower heat, and simmer with lid on until all water is absorbed (15-20 minutes). Remove lid and let rest 5-10 minutes. Dry roast pine nuts in 300 F oven until they begin to change colour, about 10 minutes. Combine olive oil, lemon juice, mint, and parsley in a large bowl. Add cranberries, feta, toasted pine nuts, and toss. Add cooked warm quinoa a little at a time. Toss well. Serve at a room temperature.